This topic walks you through the steps for using the command line to apply either a binary update or an application (AOT) deployable package that was created in your development or build environment. For most types of environments, you can apply a deployable package to an environment directly from Microsoft Dynamics Lifecycle Services (LCS). For more information, see Apply a deployable package on a system. Therefore, this topic applies primarily to environment types that don't support the application of updates via LCS. Examples include local development environments (downloadable virtual hard disks [VHDs]), multi-box development/test environments in Microsoft Azure (LCS Partner and trial projects), and build environments. However, you can also use this topic any time that you want to install deployable packages by using the command line instead of LCS. Deployable package – A deployable package is a unit of deployment that can be applied to any environment. It can consist of a binary hotfix to the runtime components of Application Object Server (AOS), an updated application package, or a new application package. AXUpdateInstaller – AXUpdateInstaller is an executable program that is bundled in the deployable package. When the package is downloaded to a computer, the installer is available. Runbook – The deployment runbook is a series of steps that is generated and used to apply the deployable package to the target environment. Some of the steps are automated, and some are manual. AXUpdateInstaller enables these steps to be run one at a time and in the correct order. An AOT deployable package is a package that contains customizations and extensions to your application. If you want to use the command line just to install an AOT deployable package on a development or demo environment, follow the instructions in this section. You can then skip the rest of this topic. On the virtual machine (VM), download the zip file for the deployable package. Make sure that the zip file is stored in a non-user folder. After you download the zip file, right-click it, and then select Properties. Then, in the Properties dialog box, on the General tab, select Unblock to unlock the files. Open a Command Prompt window, and go to the folder where you extracted the deployable package. The devinstall option installs the AOT deployable package on the VM. As of Microsoft Dynamics 365 for Finance and Operations, Enterprise edition with platform update 12, the devinstall option doesn't require that you be an administrator on the VM. This command doesn't run database synchronization. You must run database synchronization from Microsoft Visual Studio after you install the deployable package. In LCS, on the Environment page, select the name of a VM. Establish a Remote Desktop connection to the VM by using the user name and password that are provided on the Environment page. On the VM, download the zip file for the deployable package from LCS. Make sure that the zip file is stored in a non-user folder. 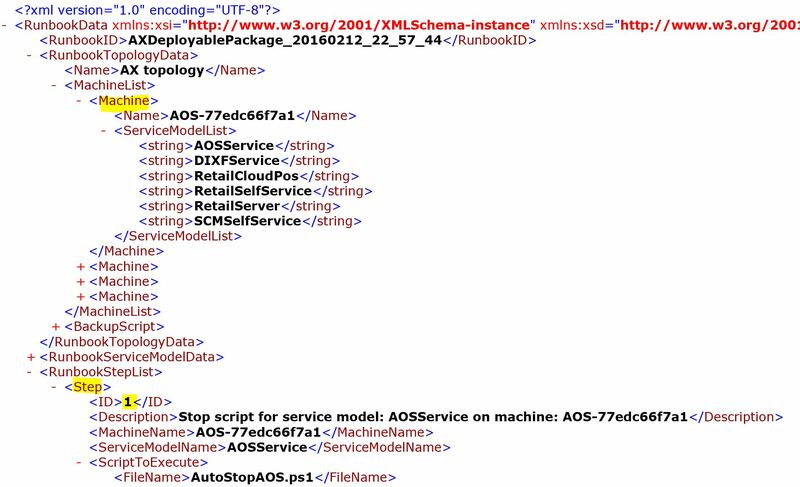 In the folder where you extracted the deployable package, find and open the file that is named DefaultTopologyData.xml. You must specify the VM name and the installed components in this file. In File Explorer, right-click This PC, and then select Properties. In the system properties, find and make a note of the computer name (for example, AOS-950ed2c3e7b). In the DefaultTopologyData.xml file, replace the machine name with the computer name that you found in the previous step. Open a Command Prompt window as an administrator. Go to the extracted folder, and run the following command to see a list of all the components that are installed on the computer. Update the DefaultTopologyData.xml file with the list of components. When you've finished specifying the VM name and the installed components, the DefaultTopologyData.xml file should resemble the following illustration. 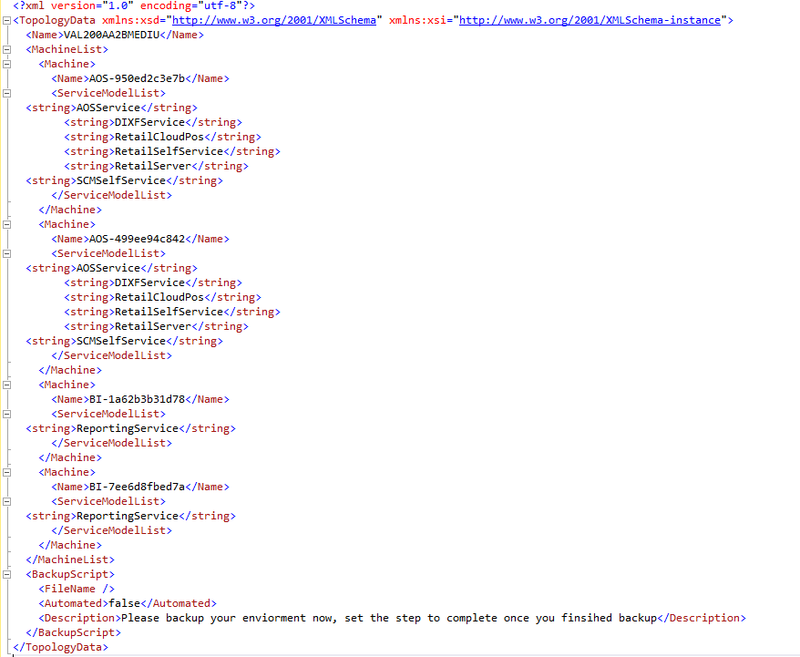 Repeat steps 1 through 4 for every other VM that is listed on the Environment page. Based on the topology information in the DefaultTopologyData.xml file, you must generate the runbook file that will provide step-by-step instructions for updating each VM. On any VM, run the following command to generate the runbook. [runbookID]– A parameter that is specified by the developer who applies the deployable package. [topologyFile]– The path of the DefaultTopologyData.xml file. 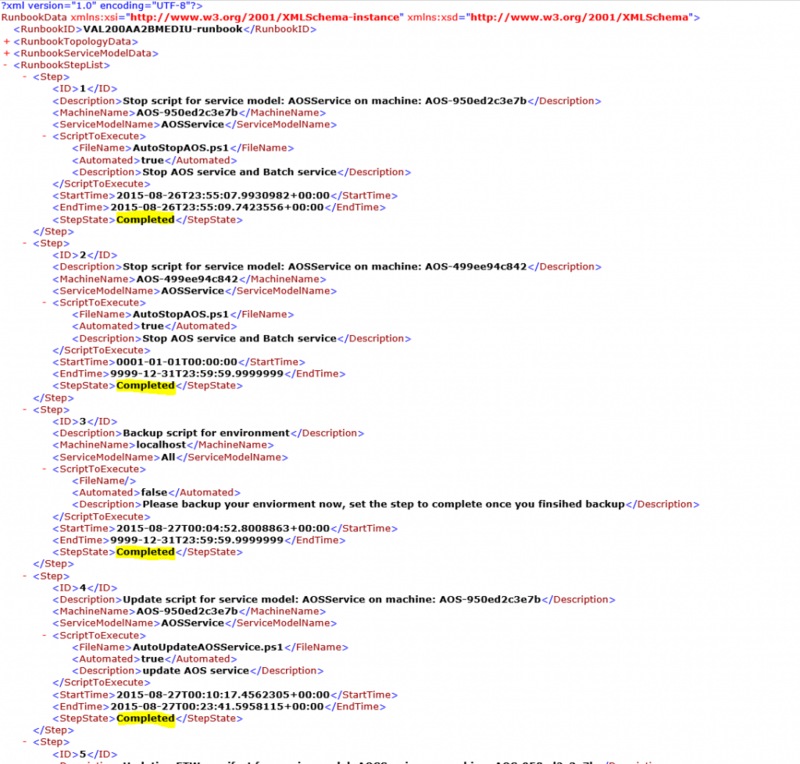 [serviceModelFile]– The path of the DefaultServiceModelData.xml file. [runbookFile]– The name of the runbook file to generate (for example, AOSRunbook.xml). AXUpdateInstaller.exe generate -runbookid="VAL200AA2BMEDIU-runbook" -topologyfile="DefaultTopologyData.xml" -servicemodelfile="DefaultServiceModelData.xml" -runbookfile="VAL200AA2BMEDIU-runbook.xml"
The runbook provides the sequence of steps that must be run to update the environment. The following illustration shows an example of a runbook file. Each step in a runbook is associated with an ID, a machine name, and step execution details. Import the runbook by running the following command. AXUpdateInstaller updates the runbook file after each step is run on a VM. The runbook also logs information about each step. For manual steps, follow the instructions, and then run the following command to mark the step as completed in the runbook. If errors occur during any step, debug the script or the instructions in the step, and update accordingly. Repeat step 1 on every other VM that is listed in the runbook file. For one-box environments, such as development, build, and demo environments, there is only one VM. Run the following command to verify that the new updates are installed. View the runbook to see the completed steps. Here is an example of a runbook file where the steps have been completed. You must analyze the downtime requirements for production, and so on. You must send the file to Microsoft because a deployable package can't be installed. If any step in the runbook fails, you can rerun it by running the following command. To prevent version mismatch or downgrade, or installation of the same deployable package, run the following command. To verify database synchronization, in the aosservce\scripts\ folder, find and open the dbsync.error.txt file, and look for any errors.